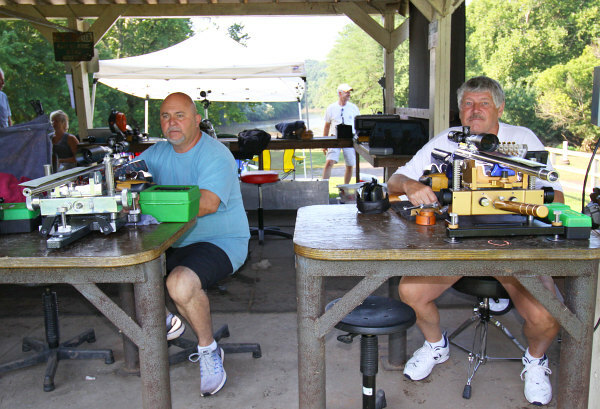 Many of the nation’s best Score Benchrest shooters came to Maryland last month for the IBS 200/300-Yard Score Nationals. This is a one-shot-per-bullseye discipline dominated by accurate 30-caliber cartridges such as the 30 BR. 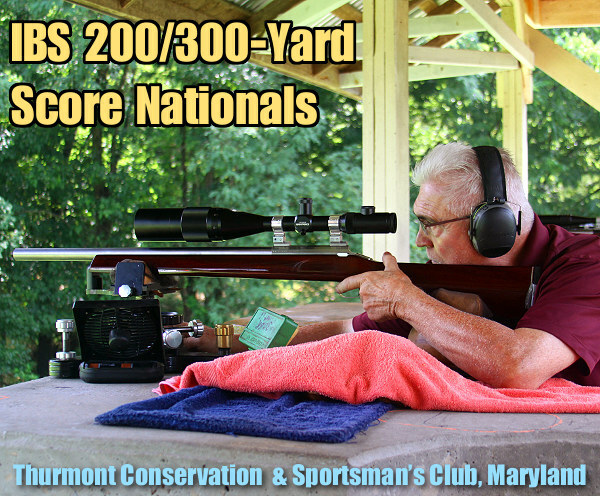 Over the weekend of the 4th and 5th of August, 42 shooters participated in the 2018 IBS 200/300-Yard Score Nationals, held at the Thurmont Conservaton & Sportsman’s Club, in Thurmont, Maryland. 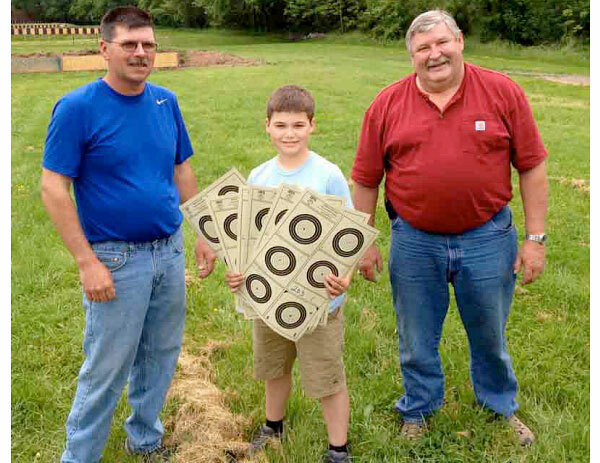 Forty-one competitors shot Varmint for Score (VFS). Between the two 6X disciplines there were six competitors, equally divided between Hunter (H) and Varmint Hunter (VH). Dewey Hancock was “Top Gun” for the match, winning the VFS 200/300 Grand Agg with 500-23X, a possible new record. There are six bullseyes on an IBS Score target. Competitors take one shot per bull for five scored shots. The sixth (bottom right) bullseye is reserved for sighter shots. Hot and Humid in Maryland — The match director described the weather as very hot and humid. On Saturday, the temperature varied from 66 to 81 degrees, the humidity from 62 to 100 %, and the wind speed from 0 to 9 mph. On Sunday, things warmed up a bit, the humidity was reported as a little lower, as was the wind speed. 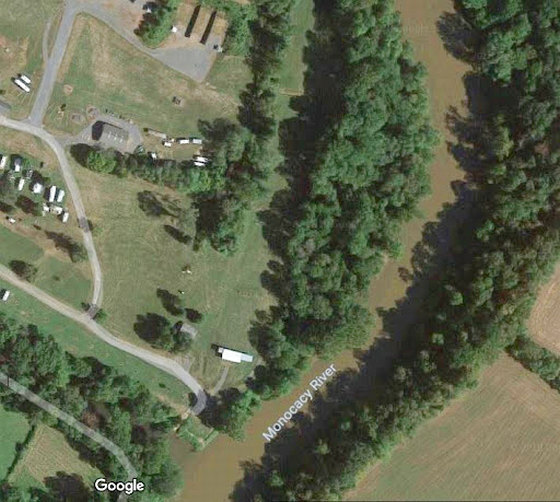 The Green Fields of Thurmont — With recent rains at Thurmont, lush green grass stretched from firing line to targets. This elicits envy from a shooter who has spent all of his time on ranges that do not have a single blade of green anywhere, except for a few weeks during a short rainy season. To my eyes, this range is beautiful. 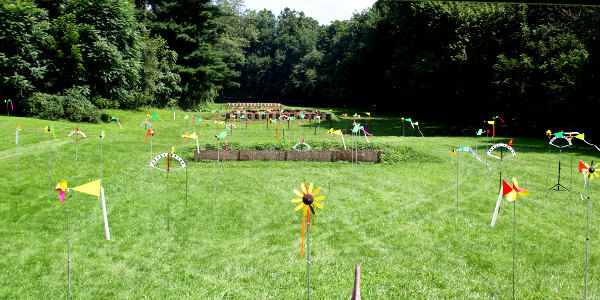 Thurmont shooters are blessed with a truly outstanding facility that serves all types of shooting. There are fifteen covered benches of mixed construction under a sturdy cover, with plenty of parking both for vehicles and RVs. 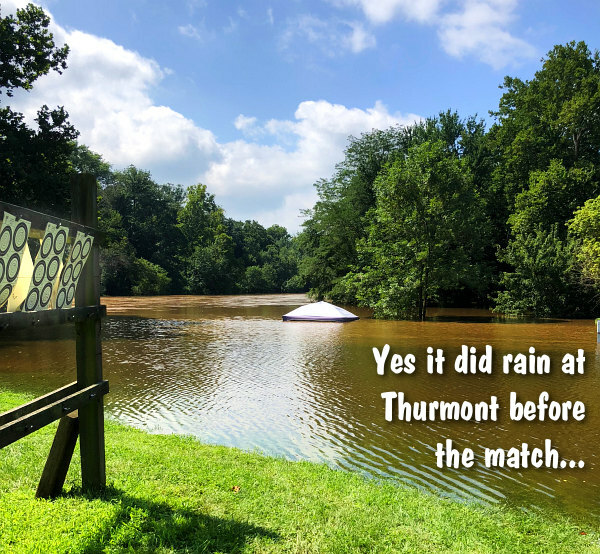 Learn more about the Thurmont Club at TCandSC.org. Can anyone identify that big gold-tone coaxial rest on the right? 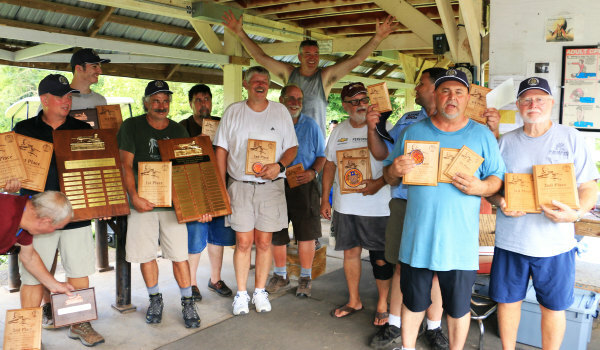 The VFS Grand Aggregate Top Five were: Dewey Hancock (1st Place), John Bosley (2nd), Ronnie Milford (3rd), Brian Fitch (4th), and Jim Cline (5th). 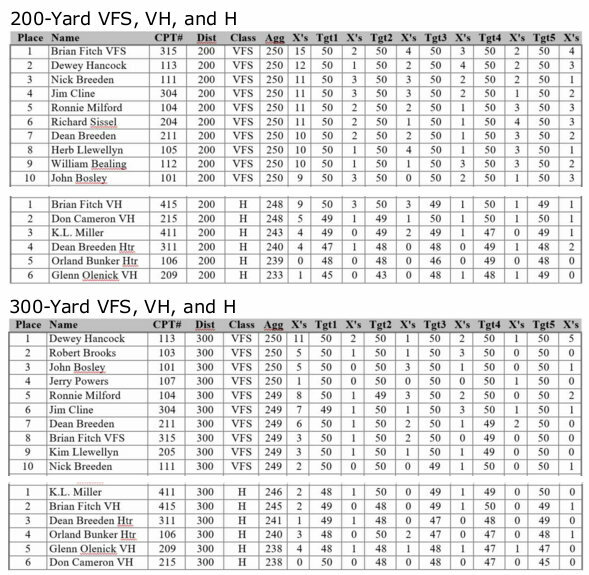 VFS winner Dewey Hancock shot a possible new 200/300 yard record with a 500-23X. Top shooters left to right: Dewey Hancock, Nick Breeden, Brian Fitch, Glen Olenick, Robert Brooks, Steve Cameron, Dean Breeden (arms raised), KL Miller, Jim Cline, Ronnie Milford, John Bosley. 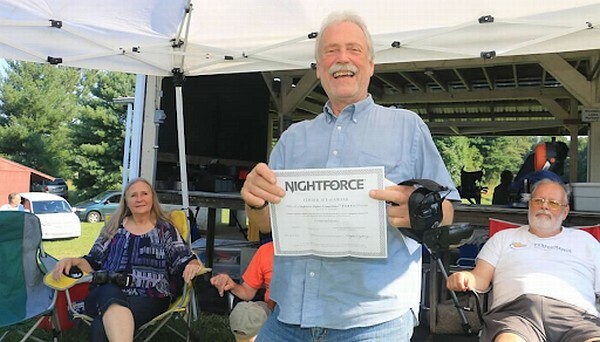 Wayne France — with the “I just won a Nightforce” smile! Steve Eller smiling — BIB Bullets from Randy Robinette are always a good choice. Match directors do not get the appreciation they deserve. The match calendar would be blank without them. Score Nationals Match director Dean Breeden ran a great show here. 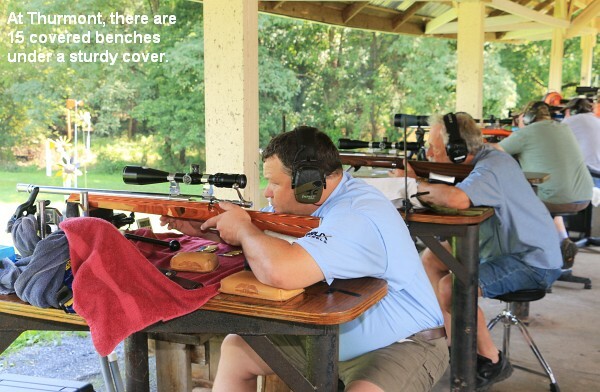 In addition to rescuing a trailer from flood waters, and running the 200/300 Score Nationals, Dean also himself competed at the Nationals, shooting two rifles. He did well, with Top Ten finishes at both distances, in both VFS and Hunter classes (3rd in Hunter at 300 yards). 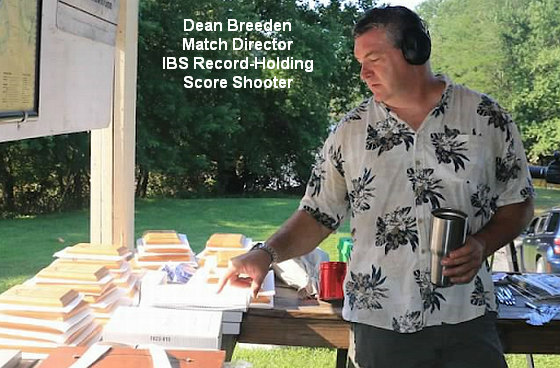 While Dean may be under-appreciated as a match director, Dean is widely recognized as one of the best IBS score shooters out there. 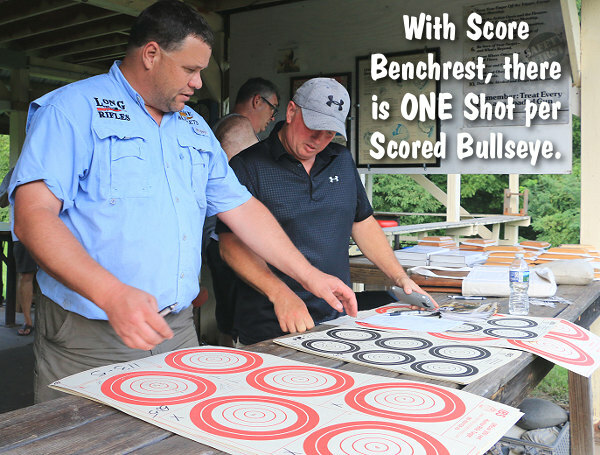 Dean holds six (6) current IBS Score Shooting records. Share the post "IBS Match Report: 2018 200/300-Yard Score Nationals"
Randy Robinett, founder of BIB Bullets, is a highly respected custom bullet-maker. 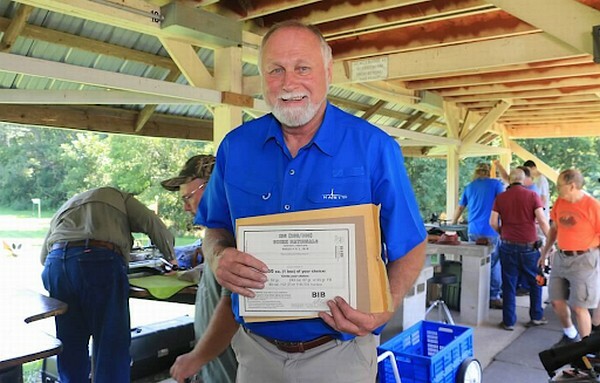 In recent years, Randy’s 30-caliber projectiles have won countless benchrest-for-score matches, and captured many National titles. If you want to “run with the big dogs” in score competition, campaigning a 30BR with BIB bullets is a very smart way to go. In this article, Randy talks about the process of creating highly uniform cores for benchrest bullets. This article originally started as an exchange of posts in Stan Ware’s Bench-Talk Forum. Stan, a gifted gunsmith, converted the Forum posts into an article, which first appeared on Stan’s Bench-Talk.com Website. OK, Stan “made me do it”! A while back, Stan Ware asked if I’d submit a ditty on bullet-making. Here is the “picture is worth a few words” version. Below is a photo of a spool of lead wire. 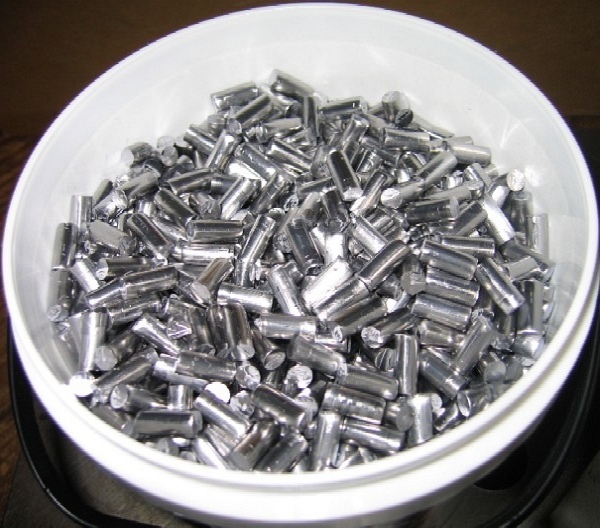 This is the first step in making benchrest-quality bullets. This spool of .250″ diameter lead wire will be cut into approximately 130 pieces, each about thirty inches long. Here’s a really neat machine built by my Uncle and BIG MIKE. This is the core cutter. We made it using scrap steel and borrowed the crank shaft out of a 1966 Yamaha motorcycle to get the desired reciprocating-motion slide. When properly “juiced”, this machine can cut more than 3000 cores per hour. As you doubtless deduced, the “sticks” are inserted, then fed via gravity — straightness is a virtue here! The crank, for now, is powered by the human hand. The bucket contents are the result of loading the cutter and turning the crank wheel. This photo shows cores for 112 grain, .30-caliber bullets. There are about 2500 cores to the bucket. Here’s a close-up of the business end of the core cutter. Using recorded micrometer settings, this clever design allows us to get very repeatable length when changing through the length/weight cycle. The photo below provides a closer look at the just-cut cores. Note the relatively clean shanks and square, unflared ends. This bucket contains roughly 2500 cores. By contrast, a tour of the Hornady plant will reveal cores being cut and squirted via a single operation, and deposited into 50-100 gallon livestock watering tanks! Upon my first tour of a commercial plant, I lost all feelings of guilt about the cost of custom, hand-made bullets. When one totals the amount of labor, “feel” and “culling” that goes into them, custom hand-made bullets represent one of the best bargains on the planet! At Hornady, each press produces 50-55,000 finished bullets per 10-hour shift. By contrast, a maker of hand-crafted bullets, at best, may make 3% of that number during a 10-hour span! 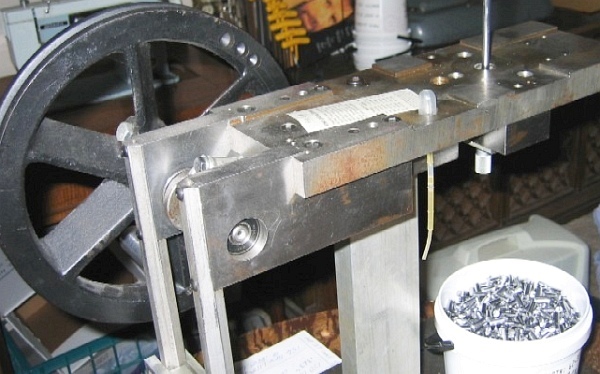 Yep, hand-made benchrest-quality bullets are a labor of love and should be purchased with these criteria in mind: 1) QUALITY; 2) availability; 3) price. 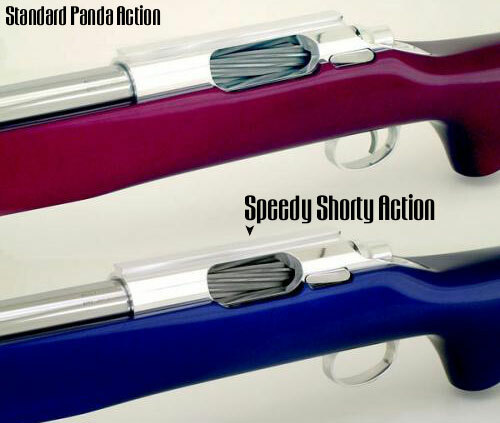 There is no reason for a maker of hand-made benchrest-quality bullets to negotiate on price. His time is worth what one receives from the bargain! Randy’s original Bench-Talk Forum posts inspired some questions by Forum members. Here are Randy’s answers to spedific questions about core-making. Question by Stan Ware: Randy, a post or two back you said the cores were cut into 30″ lengths first and straightened. Why do you cut to 30″ lengths? What is the reason for this? Answer by Randy: Stan, the wire is cut into 30″ lengths (sticks) and then straightened, following which it is fed into the core cutter and cut into the individual individual “cores”. If you look at the core cutter photo above, you’ll see a stick of lead wire sticking up -it’s toward the right hand end of the contraption. The cut cores are also “ejected” by gravity — the white “tickler” brushes the cores as the slide moves forward and dislodges the core from the cutter bushing. Q by GregP: Randy, How do you straighten the 30″ sticks? Roll them between metal plates? Answer by Randy: Greg, BIG MIKE may kill me for letting out the secret. WE “roll” the wire between an aluminum plate, which is equipped with handles, and the “plate” which you can see in the pic of cutting the wire. The straightening is really a drag. Eventually, we will have the new cutter hooked up to a “feeder/straightener” and the wire will be cut into core slugs right off the roll! Well, that’s the Dream…. Question by Jim Saubier: How much of a nub do you use at the end of the 30″ section? I imagine that every section you will lose a little from the feed end. Your cutter looks real slick, we are using the manual deal and it isn’t quick by any means. Answer by Randy: Jim, Since I cut all of the sticks using diagonal-cutting pliers, the ends are, indeed, waste. However, only about 1/8th inch on the beginning end — the final core may be too short. 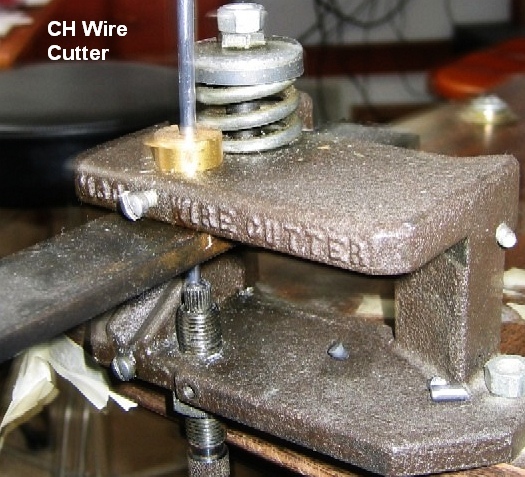 I have attached a pic of my old reliable CH cutter. I still use this cutter for .22-cal and 6mm cores and, occasionally, an odd lot of thirties. The CH cuts very square ends which are free of bulges and/or flaring. 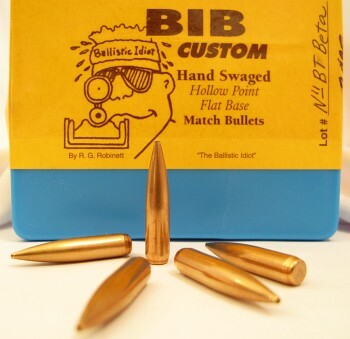 Share the post "Perfection at the Core — Bullet Making Tips from BIB Bullets"